Had errands to run this morning. I'm certainly not back up to speed. It wore me out, which is really annoying. Got home, had a nap. Habibi did the same ... it's hard work staying home waiting for Mommy! Later I wandered up to the studio and spent some time with Medicine Woman. The more time I spend with her, the more grounded she becomes on the canvas, the more I can feel her ancient energy. She speaks to me in ways I can't explain in words. She has led me to the story of Bridgid, the Celtic Goddess. Who am I to question. I'm not finished yet, however, when I am, I will tell you the entire story. Here's what happened today. Probably one more day of work will complete her. 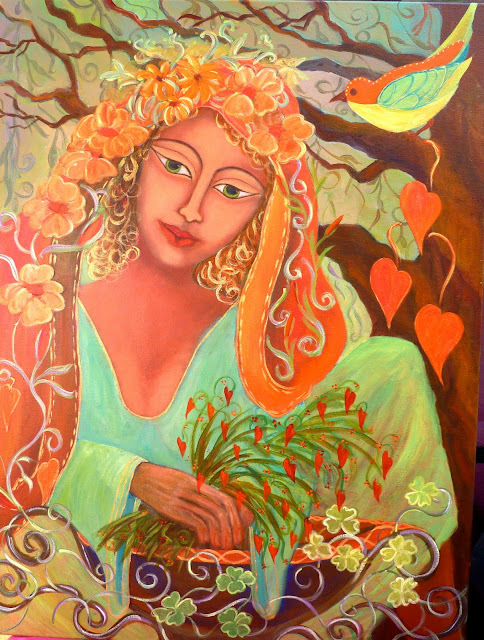 I was poised, paintbrush in hand, to paint a bouquet of herbs in her hands when suddenly I heard the word 'heartlets'. "Heartlets?" I was baffled. "A bouquet of small hearts. After all, love is the greatest healer. How do you expect me to make my potions and medicine bundles without adding love?" I painted heartlets. I also began to paint the shamrocks with three leaves. It was part of why they were coveted by the Celts. Again I heard "A shamrock with four. You have no idea the power they contain and impart to those who hold them. Yes, I want shamrocks with four." And so it is. Shamrocks with four and heartlets. Celtic beliefs. "Women were highly honored, female symbolism formed the most sacred images in the religious cosmos, and the relationship with motherhood was the central elements of the social fabric the society was held together by common allegiance to the customs of the tribe loosely organized around the traditions of the goddess"
Can she get anymore beautiful? Heartlets and four leaf clovers, she is a wise wise girl and you are a beautiful person for her to go through, no wonder she chose you. You depicted them with feeling and beauty. Love the Celtic bit about goddesses, we (us girls) are all goddesses, some people still just don't realise it. Colors are lovely... heartlets, too. I just came across an site you might be interested in. Art retreats in your city. Maybe you know about them already. In case not, the site is Tesoro del Corazon. Lovely photos of your area on their blog. I love seeing the new detail every few days. It just gets more lovely. I'll bet it's heaven working in the newly organized studio. Love love her. To me she is beautiful as she is. You are so talented. So glad you got a nap yesterday....so did I. Beautiful work, beautiful story. It's an auditory version of something that happens to me from time to time when drawing with ink. Sometimes the ink tells me where to go ... it's almost as if an aura appears on the paper. Your work is beautiful and, I know this will sound odd, but reassuring. My comments for this one have gone on another post damn that Blogger ! Beautiful heartlets and shamrocks she is a pure vision of loveliness. "After all, love is the greatest healer." Oh wow! Medicine woman will definitely get associated with the other women on and within your walls. She will share her love and healing powers. No creativity for me today...like you I ran errands and tonight I'm going to bed early to read. Tomorrow . . . the end of the story. Can't wait. Hope you rest well too.